Your week of eating healthy starts here. You’ve probably seen one on Pinterest, scrolled past it on Instagram, or dog-eared a variation of it from the pages of your favorite foodie magazine. 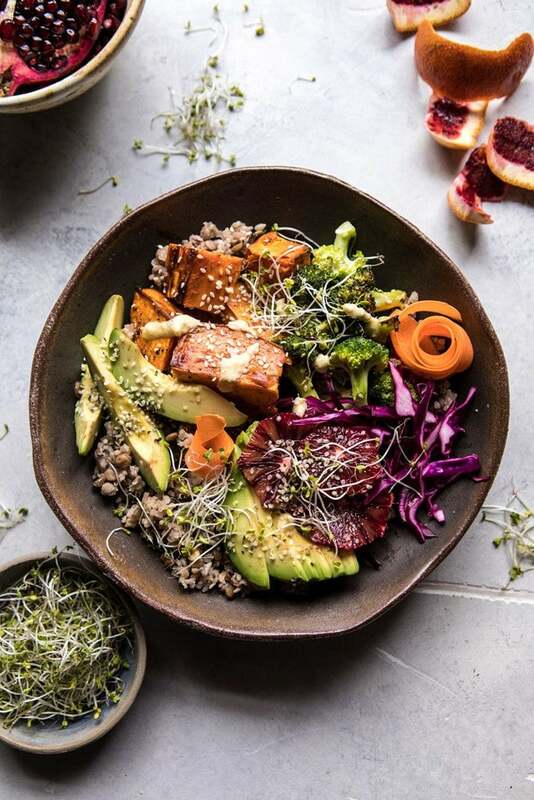 It’s no secret that macro bowls have been making a splash as of late—especially in the realm of healthy eating—and it’s easy to see why. The foundation of a macro bowl typically tends to remain the same. At its core, it consists of a combination of healthy grains, vegetables, beans, and some sort of healthy fat (read avocado). And while there are (arguably) myriad ways in which one may assemble the nutrient-packed dish, the foundation of the concept remains the same. Ahead, the macro bowl recipes you need to get that jump-start on eating green. We’re always in favor of eating a more colorful diet, especially if it comes in the form of a nutritiously balanced meal. Loaded with beets and purple cabbage, this white rice-based dish comes with a refreshing hint of parsley and toasted walnuts for added crunch. Get the recipe on Heartbeet Kitchen. Courtesy of Flora & Vino. Taco Tuesday comes in a less indulgent and decidedly more healthy form, courtesy of these flavorful macro bowls. Packed with raw zucchini noodles, kale, salsa, and guacamole, this spicy combo is a must. Get the recipe on Flora & Vino. Broccoli, cabbage, and avocado are three of the more common ingredients one can expect to find in a macro bowl. This clever take definitely puts a refreshing spin on the classic thanks to the addition of the blood orange and turmeric-ginger vinaigrette. Homemade falafels definitely sets this one apart from the rest. Roasted veggies seasoned with cumin complement the spinach base while jalapenos bring on an added kick with a healthy dose of spice. While this one may embody the usual scope of ingredients one may expect to find in a macro bowl, it’s the addition of the sprouted mung beans and fermented veggies that take it to the next level. Topped with a turmeric-tahini dressing and a scoop of hemp seeds for added crunch, the dynamic flavors of this one really shine through. This veggie-friendly take draws on tofu and cannellini beans for its protein source, both of which are complemented with the pickled red onion, blueberries, and scallions, resulting in a balance of rich flavors. Get the recipe on Lee From America. Take your macro bowl to the next level with the addition of a fried egg on top. Fennel adds a refreshing touch while roasted brussels sprouts and sliced white button mushrooms bring on a dynamic and elevated twist. Get the recipe on The Feed Feed. Eating colorfully just got a whole lot easier thanks to this vibrant take on the macro bowl. Set on a bed of quinoa, this one comes loaded with edamame, beets, watermelon radish, and so much more—drizzled on top, a spicy tahini sauce that seals the deal. Get the recipe on The Green Life. Turmeric is the undeniable star of the show of this vegan and gluten-free bowl, which can be paired with a wide variety of greens. Topped with a tahini-vinaigrette, this blend combines an array of healthy ingredients such as broccoli, kale, and carrots. Get the recipe on Nourish Every Day. Roasted sweet potatoes, quinoa, and chickpeas were made for one another, and this vegan-friendly bowl is all the proof you need. Pair with a dollop of hummus for an entirely filling (and delicious) touch.Get the recipe on Oh She Glows.